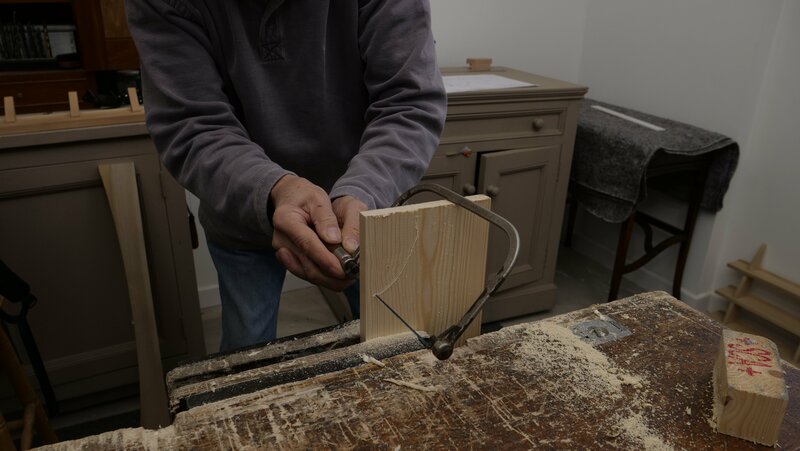 The Western saws we use don’t cut on the pull-stroke, so you are cutting on the push-stroke and only using the pull-stroke to retrieve the saw ready for the next stroke. Put your non-dominant foot forward and your dominant foot back, this will enable you to drive pressure forward. 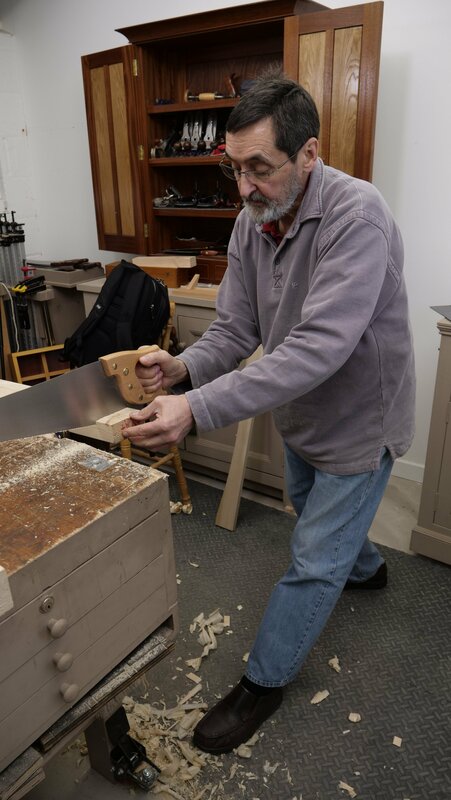 Pointing your index finger forward along the handle will give direction to the tool. 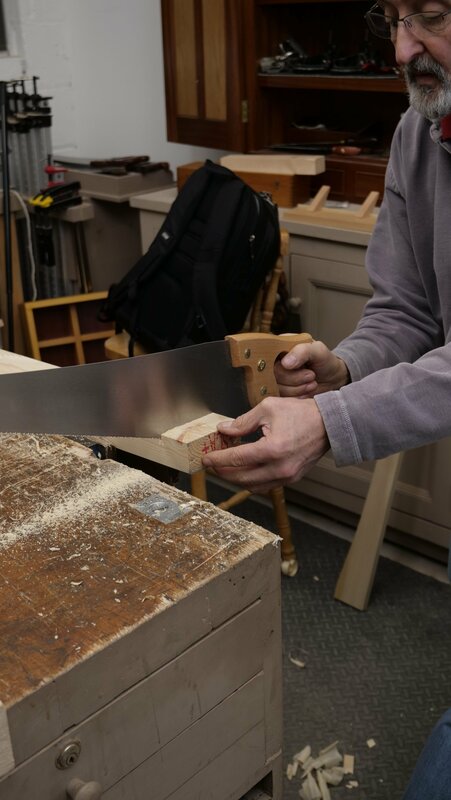 The first 4-5 cuts determine the direction of the saw, if you find you are going off the path, go back up the top and use the side of the teeth at the point where you went wrong, this should enable you to correct your path. 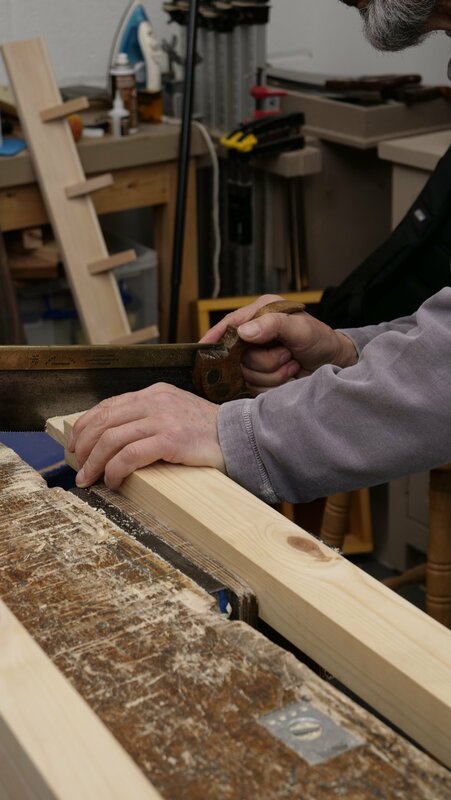 If you have cut deep into the wood correctly but have veered off your path towards the end, you can start again from where you went wrong instead of starting the whole cut again. When starting the cut, saw above the wood, as you push it forward bring the saw down to come into contact with the wood. If the saw keeps jarring, use less pressure, not more and it should make the forward stroke easier. Use your thumb as a guide to start off the cut. Once you are 4 or 5 strokes in, you can remove your thumb as the saw is unlikely to deviate from this path. 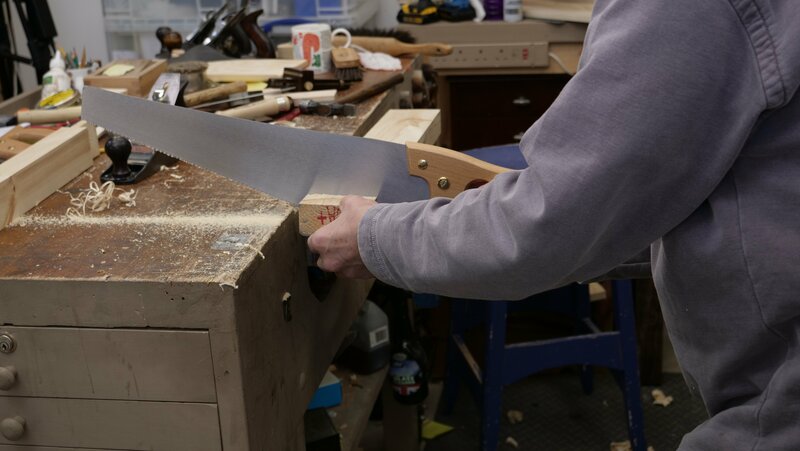 To minimise vibrations, hold the wood in your non-dominant hand while you saw, keeping your fingers away from the blade. 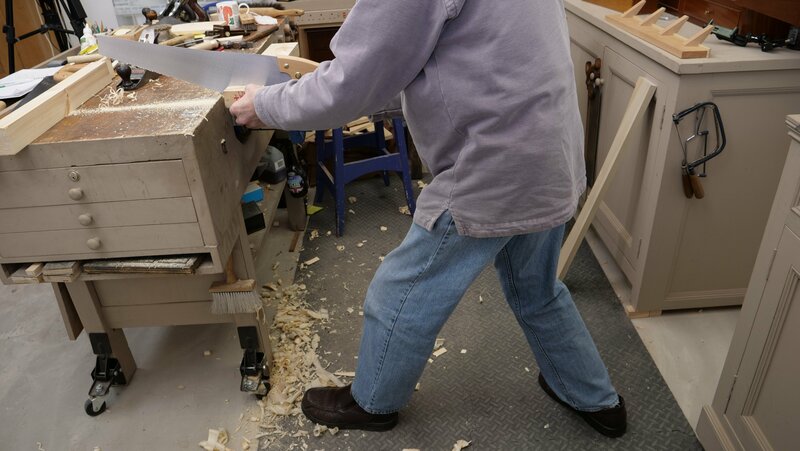 When you are reaching the end of your cut, support and stabilise the waste wood. Having your dominant foot slightly back enables you to get lower and use a longer arm stroke. 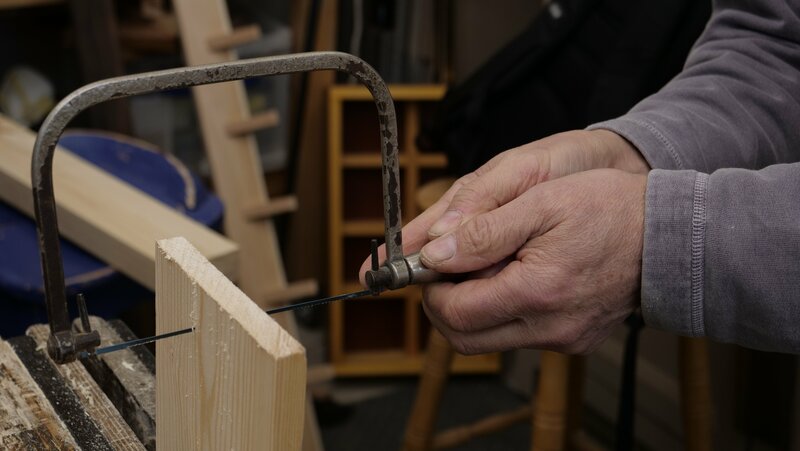 A coping saw can usually be used from an upright standing position, this is because it does not require that much force to cut. As this is mainly used for curves, the direction of the blade can be adjusted easily with a series of short strokes, the blade should only be turned on a forward cut. When replacing the blade, the teeth should be facing forward (away from you). Use two hands to hold the handle. The frame can be adjusted to sit at different angles allowing you to cut complicated shapes easily, as the blade is so narrow it can change direction quickly with a succession of short and fast strokes.